UPSRLM is stand for “ Uttar Pradesh State Rural Livelihoods Mission”. This organization under Government of UP is going to recruit fresher Indian candidates for various manger and assistant posts. 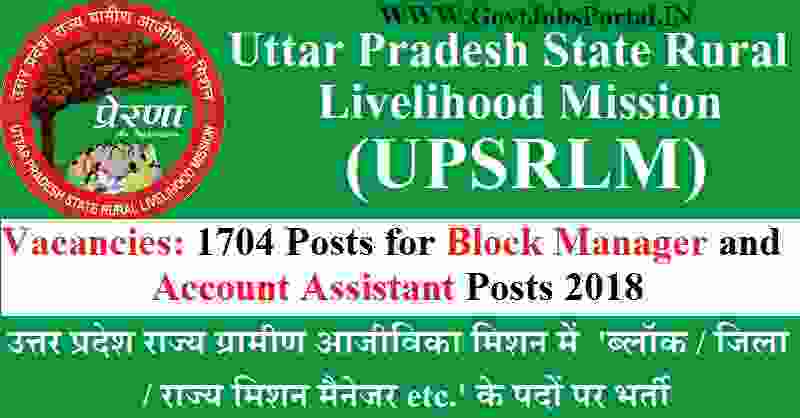 UPSRLM issued an official notification in which they are directly inviting all eligible candidates to apply these Government jobs in UP. In the official PDF file they said that there are total 1704 vacant positions for various job profile. All these vacant positions are going to filling up through this recruitment process. More detailed information about these Govt jobs in Uttar Pradesh state is given below in this article. Read it carefully before applying. Block Mission Managers Monitoring & Evaluation, M.I.S. District Mission Managers Monitoring & Evaluation, M.I.S. What is the eligibility Criteria for applying this Recruitment? PG Diploma in above disciplines. For applying District and Block level Posts must have age less than 40 years. For applying State level Posts age must be less than 50 years. What is the Application Fee for applying these Govt jobs in UP? Those who satisfied educational and age criteria can apply these Government jobs in India by paying ZERO application fee. Department is inviting all Indian candidates to apply without paying application fee. What is the Procedure for applying these Government jobs in UP? Candidates can apply online through the official website for these posts. We took this information from the following website: https://www.sids.co.in/upsrlm/. Under IMPORTANT LINK section we also share the reference link as well as the direct link for applying online. 12TH Aug. 2018 is the Starting Date to apply. 31st Aug. 2018 is the Last Date for applying.